Last year I bought myself a Nuface handheld microcurrent device. The rep used the Nuface on one side of a woman’s face but not the other. In about 10 minutes you could see quite a noticeable lift on the side that received the Nuface. I’m a certified Beautiful Image Microcurrent Specialist so the easy-to-use portable device looked great. After watching the Nuface rep work on a couple girls and get easy, quick results I had to try it out for myself. Once I got my Nuface, I tried it out right away. It comes with a conductive jelly to make sure the electricity doesn’t shock you. The jelly is the same kind of gel you would use for a sonogram. You can also use any gel-based mask such as Aloe vera as conductive gel. After watching the short instructional DVD and using the product a couple times, I found it so easy to work with that I could use it on my face while watching TV. It takes about 10-20 minutes each treatment. For best results, use it at least a few times per week at first and after a month drop it down to a couple times per week. Microcurrent helps stimulate and tone the muscles. But just like with exercise, if you don’t use the microcurrent enough, results won’t be as good. 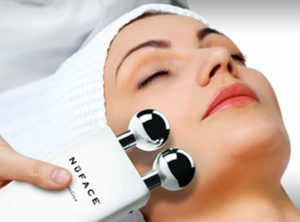 The Nuface also helps products penetrate the skin. I would put a layer of antioxidant serum on my skin and then the conductive gel. This is a great way to get the most out of your serums. Although I am still pretty young and don’t have too much sag in my face, I can notice a difference when I use this device. My eyes look more awake and open. My favorite thing Nuface does for my skin is making it really smooth. Although the device isn’t cheap, $250 to be exact, if you are the type of person who enjoys pampering yourself, this is a great system to buy. If you aren’t the kind of person who takes much time for personal pampering, most likely you won’t end up using it. There is setup and cleanup that ends up taking about 30 minutes in total. Even if you don’t end up buying this device, think about giving microcurrent therapy a chance. Many spas include microcurrent therapy in some of their treatments. It is very relaxing and healthy not only for the skin but the body as well. I’ve been using it for four months now and I absolutely love it. I have seen significant results in the lifting of my neck area and face. Highly . It has also improved the texture of my skin. It also aids in speeding up the skins healing response….not to mention an amazing glow!